When violinist Robert McDuffie launched a string training program in his native Macon, GA, in 2007, he needed a director with artistic chops, administrative savvy, and an entrepreneurial bent. 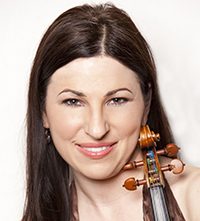 That was Amy Schwartz Moretti, a violinist trained at the Cleveland Institute of Music whose CV includes concertmaster posts at the Oregon Symphony and the Florida Orchestra. More than 10 years on, Moretti continues to build the Robert McDuffie Center for Strings, guiding 26 students in their studies, overseeing the curriculum, managing a 13-member faculty, and maintaining a busy performance career, notably as a member of the Ehnes String Quartet. She is “exactly what the 21st-century musician should look like,” says McDuffie. Located within Mercer University’s Townsend School of Music (about an hour south of Atlanta), the institute trains 12 violinists, six violists, six cellists, and two double bassists, all of whom receive full tuition scholarships toward bachelor’s degrees or artist diplomas. Among Moretti’s responsibilities is wrangling a busy faculty that, apart from herself and McDuffie, includes Philadelphia Orchestra concertmaster David Kim, Emerson String Quartet violist Lawrence Dutton, and Julie Albers, principal cellist of the St. Paul Chamber Orchestra. Moretti also brings in notable artists for concerts in Mercer’s 200-seat Fickling Hall. “When they come to campus, they give master classes and interact with the students,” she says. Under Moretti’s direction, in 2015 the center moved into the Bell House, an antebellum mansion now outfitted with practice rooms and a 60-seat auditorium. The McDuffie Center has developed affiliations with the New World Symphony and the Brevard Music Festival. Last October, Moretti forged a partnership with Mercer University’s men’s basketball team, in which basketball players and string players attended each other’s events and socialized. Future plans include launching a BM degree in which students can take such courses as marketing, management, and accounting through Mercer’s business school. “We’re excited for this big step to complete a longtime goal of ours,” says Moretti.